FWIW - I had 30 inches worth of fans on my MR2 turbo. 2 x 11" SPAL fans in a custom shroud on the engine lid (drawing air from the bay upwards and out) and another 8" Davies Craig on the side mount intercooler. The 3 of these fans were hooked up to the ignition and ran full time. These worked so well that even after a *very* spirited run on a summers day, I parked up the car and could put my hands on every turbo/intake/intercooler pipe in the engine bay - immediately after stopping. The only downside was the fans were loud, not that you could hear them over my exhaust anyway. There's something to be said about having good airflow to and from the IC. The TMIC is compromised in this sense and I'd be very interested to see how you go about fitting a fan underneath and if there's any tangible benefit from doing so. It seems like it would be flat out countering the heat soak/heat rise effect under the bonnet when standing still and not in use when at highway speeds. Have you considered W2A or even a FMIC approach? ...The TMIC is compromised in this sense and I'd be very interested to see how you go about fitting a fan underneath and if there's any tangible benefit from doing so. It seems like it would be flat out countering the heat soak/heat rise effect under the bonnet when standing still and not in use when at highway speeds. Have you considered W2A or even a FMIC approach? I reckon that if the fan could be drawing air through the scoop in stationary traffic at a greater speed than hot air wants to "chimney" up through the intercooler it would work pretty well to prevent heat soak. The testing results will be fascinating. Last edited by Yowie on Fri Jan 18, 2019 11:22 am, edited 2 times in total. Something like the Process West TMIC shroud would help to alleviate the "chimney" effect, as it would seal the upper edge of the TMIC against the bonnet and force most, if not all of the fresh air being drawn by the fan to come in via the hood scoop. I put a PW TMIC and shroud on my STi and whenever I'd go for a hard run or a bit of a dig from a set of lights, I could simply tap the IC water spray button a few times and give it a good soaking which would help cool things down once I was moving. This also worked on a cool down as well. The factory system sprays a fair bit of water, enough to justify 12L reservoir in the boot. The only issue is needing to manually press the button. I've seen a few guys hook the system up so it switched upon preset RPM or boost levels which negated the need to press the button. I thought I would do an initial experiment to determine whether it is worth the trouble. I have a reasonably large intercooler 10x10x4inch core. Looking at the space available between the intercooler and the engine/pitchmount/body, there is not much room at all. So before going through the pain of installing one, I would do some checks. I went and purchased a 9inch $20 thermo fan to help me get started. I used hand held laser thermometer to take the measurements. The purpose of the test was to determine whether I would see any benefit in a heat soak position. It is hot in Sydney at the moment, ambient temp 29C. So driving to and from the fan pick up, I let the Foz sit for a while to make sure that it was truly soaked. a) Intake side of Intercooler where turbo air enters. b) Max or Min Temp seen on the core itself. Max for heat soak, min after cooling. c) Exit side of intercooler nearest to throttle body. I then decided to place the fan on the intercooler in push mode. I then decided to give it a 5 second squirt from the spray with 30 seconds of fan. Please note: the two tests started from the base heat soak, so after the fan test, I let it heat soak again before using the fan/spray combination. The vehicle was completely stationary for the tests, so I can only assume it would be better when moving with the greater air flow. The soaking effect appears to be on the core, as the hot air rises from engine beneath. So a fan stopping the heat rising appears to be beneficial. Cooling the core also appears to have an overall cooling effect on the intercooler, another benefit. I would assume that this is from the heat transfer effect. I think that this is a worthwhile project to continue. I may have to provide better temp ranges for b) to give a more accurate result and conclusion. However, the results at the moment show a significant improvement anyway. 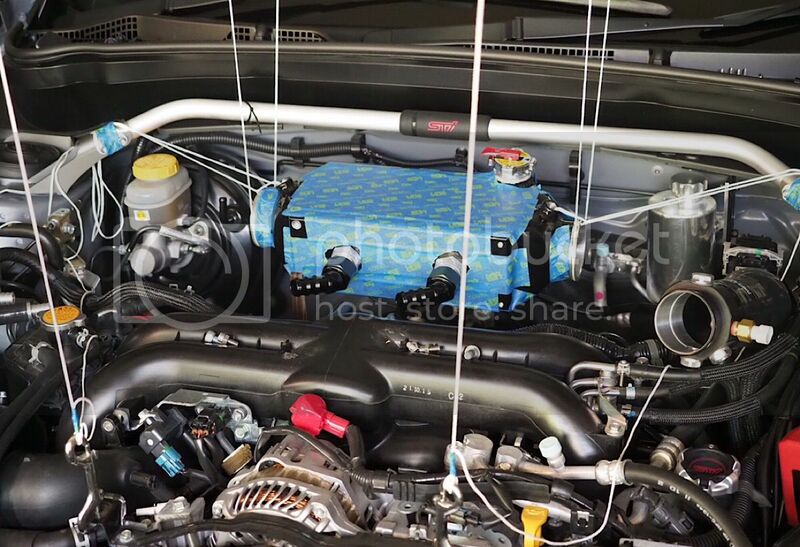 My next challenge is getting a fan to fit on the underside of the intercooler, however, if this is not possible, I would expect that even a fan sitting on the intercooler would be beneficial (but not very aesthetically pleasing). Last edited by nomads64 on Fri Jan 18, 2019 10:27 pm, edited 1 time in total. However, detailed write-ups of evidenced-based development (with paragraphs and structure) have no place on the internet. Unfortunately the rules require you to devolve this thread into a load of semi-literate rubbish. Check out some youtube comments as a style-guide. is there room in the scoop ducting for a/the fan? So back googling, found a SPAL fan which is only 51mm thick, it was $150, I thought if I was going to go down this path, I would make sure I put in quality parts. The Plazmaman kit is designed for the older aluminium manifolds. You’ll need to go custom to fit it to later models. CO2 would really be suited for drag racing applications. Couldn’t imagine the costs associated with filling a bottle every day, week or month depending on the weight of your foot.